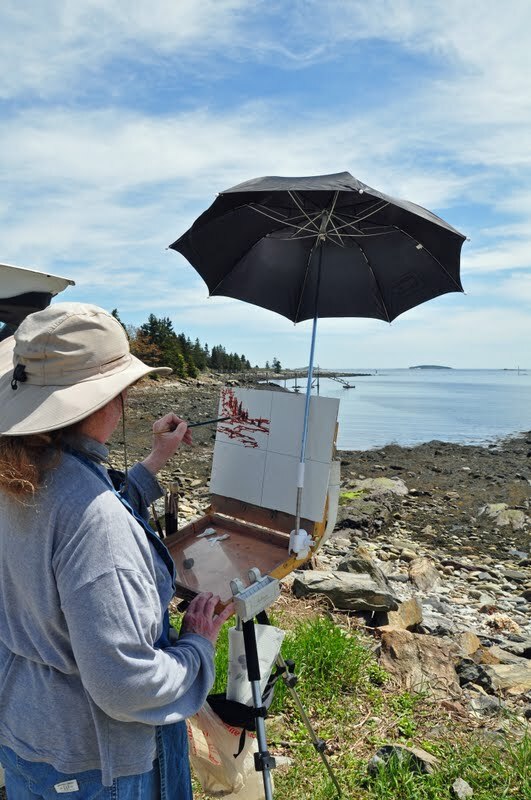 It is the only plein air group that paints regularly in the state of Maine. They paint every week somewhere in midcoast or western Maine. 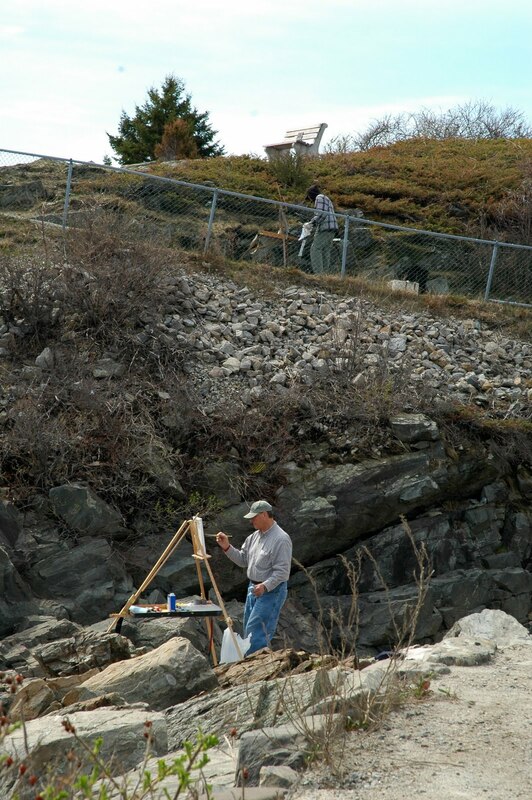 I went up to Boothbay to paint with them. There is only one road from southern Maine to the midcoast region. It is coastal Route 1, a small two lane highway with spectacular views. The midcoast region of Maine is very different from southern Maine where I live. In the south one is close to the open ocean. We have crashing surf and lots of wind. 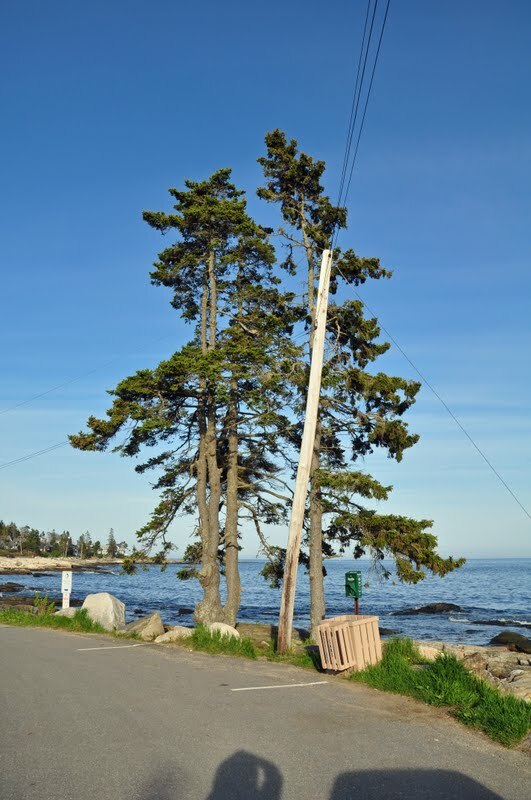 To reach the open ocean in midcoast Maine you have to drive down a long pennisula before you see it. 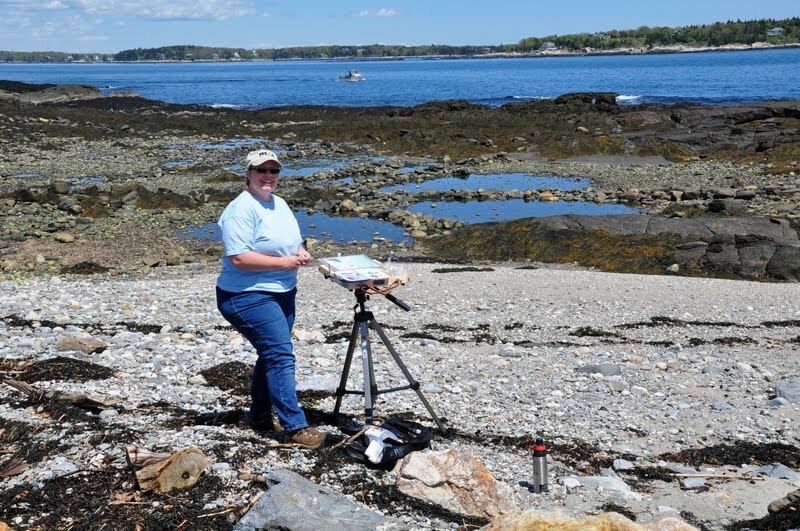 When we arrived at the PAPME painting location on Boothbay Shores along the Damariscotta River we discovered Suzanne Brewer painting on the beach! We parked the car nearby, set up and went to work. The sun was warm and the cool breeze off the water was pleasant. The area was quiet. We saw a handful of walkers and bikers. Every now and then a car drove by. Working boats went up and down the river and in and out of Ocean Harbor. Marcus set up next to me to paint with acrylics. Brave guy ! He has no experience painting, never mind painting outside. He is hoping to become good enough to enjoy it and maybe become a Sunday painter… like Winston Churchill who enjoyed plein air painting as a way to de-stress from his overwhelming responsibilities. Painting en plein air can be very calming. Its so demanding that you have to give it your full attention and forget everything else. Zen mind, painters mind! 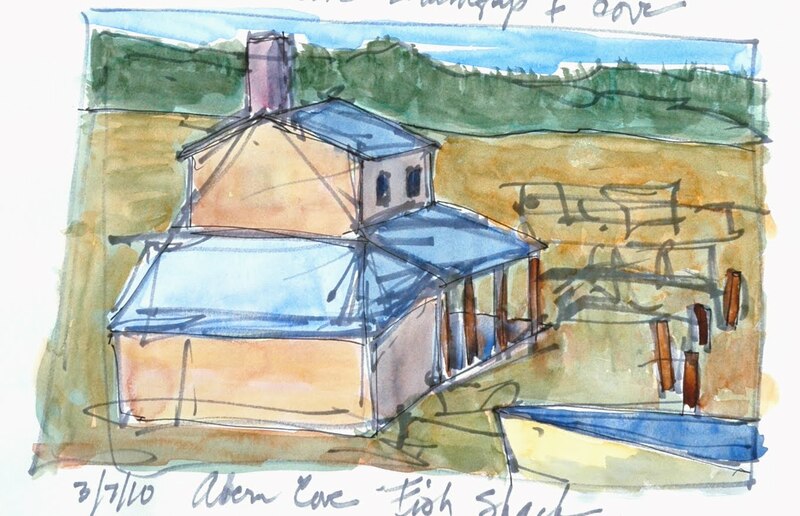 Boothbay was a new location for me so I decided to paint 4 small field studies of 4 different views. There was a nice variety of things to paint without even moving from our spot. Now that it’s almost the summer solstice the sun feels like its at high noon for hours. Marcus focused intently as he placed the different colors on his field sketches. As the sun shifted into the west I finished my sketches and started to pack up. 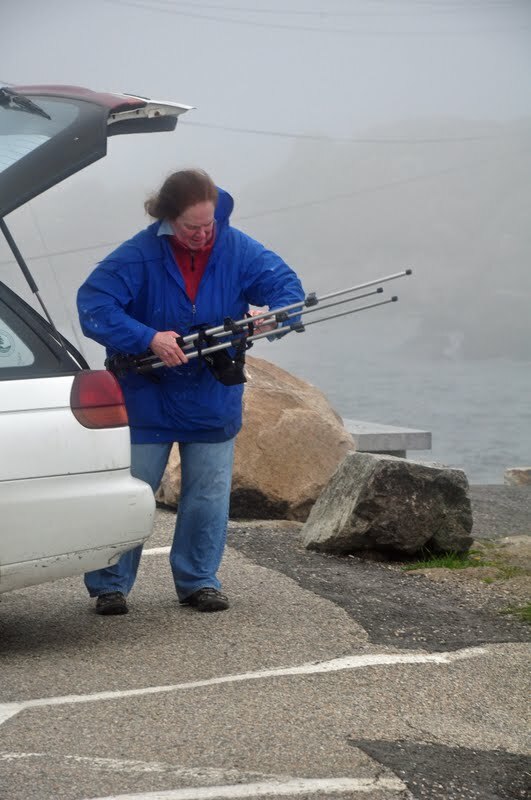 A SUV drove up and a woman got out and said “Mary?” It was Corinne McIntyre a founder of Plein Air Painters of Maine ! She heard that I had arrived after she left that morning so she drove over to meet me! She offered to take us on a tour around the tip of the pennisula and show me other painting locations. We drove the entire loop road on the pennisula. The views were gorgeous. Islands were scattered across the water. Corinne showed us a nice trail along the water to great painting locations on Grimes Cove. This area is a very old seaside summer community. The roads are right along the water. You can park right on the edge of the sea and enjoy the view. Three trees is a distinctive and well known spot. Before we left East Boothbay we stopped at Corinne’s home and Ocean Point Studio/Gallery. It was chock full of her paintings of Boothbay and midcoast. What a delight ! I’m heading back later this summer to visit her and paint some of these lovely places. After a really long cold spring summer arrived in one day. It got hot . Everything bloomed at once. The sky was clear and cloudless. At my house 8 miles in from the coast, the thermometer went up to 82. It felt too hot! 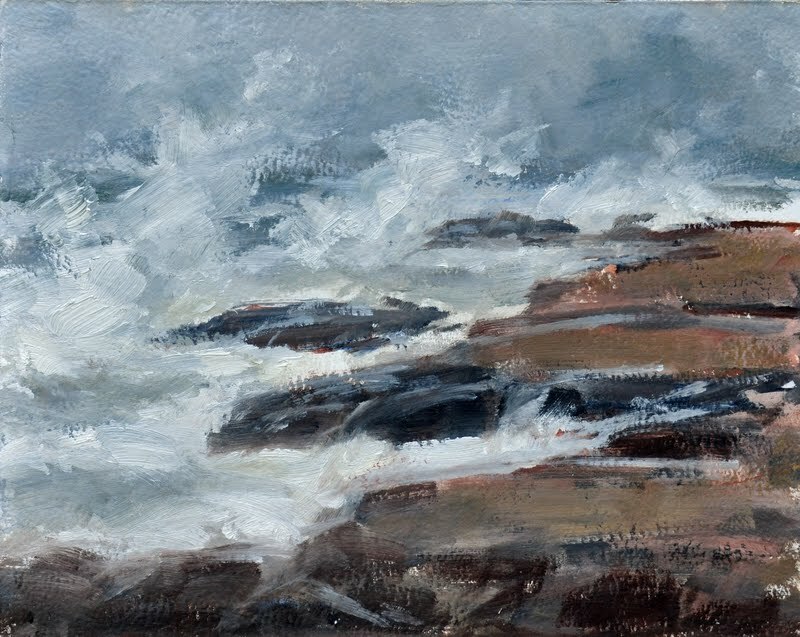 I wanted to paint in a cool spot right on the open water so I headed over to the Nubble in York Beach, Maine. The Nubble is this huge chunk of rock on the northern end of Long Sands Beach. On the very end of this peninsula is a picturesque light house. It sits on top of another smaller chunk of rock. When I got to the coast I needed to put on every piece of extra clothing I had in my car. It was a chilly 60 degrees on the water! I was happy. My polar tech vest was zipped to my chin and I wished I had packed my wool scarf. The warm air temperature from the land and the cold ocean air were manufacturing fog where they collided. Way off in the distance over the water we could see a huge fog bank . I did a quick sketch of the light house. The tide turned and started to come in. As that happened the fog bank started coming ashore. Soon the light house was only a faint ghost of its former self. The fog horn started blowing. 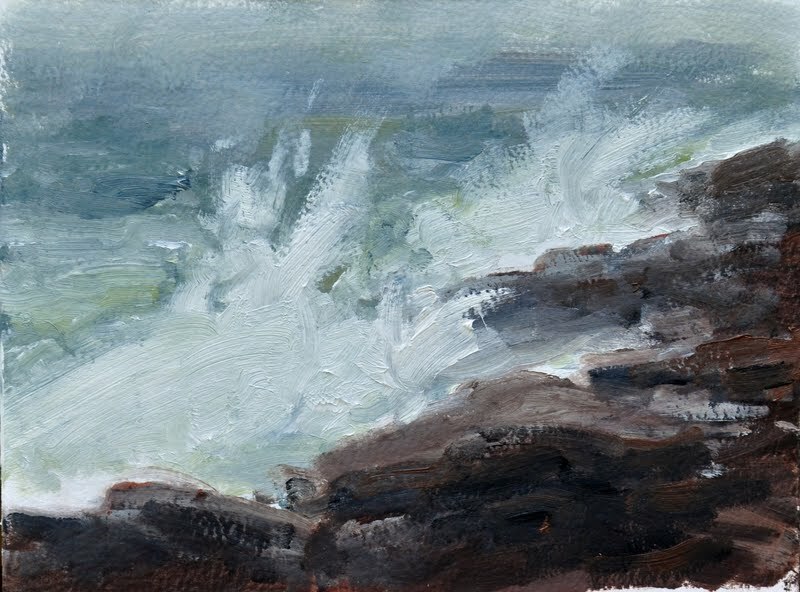 I turned and started painting the large waves crashing against the rocks below me. The wind picked up. The fog got thicker. It got really cold. The fog was so thick and wet it was coating everything, my eye glasses were useless. I could see the painting better without them. Fog dripped off the tailgate onto my head. It wasn’t even maximum high tide and the waves kept crashing in closer. A mixture of fog and salt spray filled the air. I put the last notes on my sketch. The moisture was dripping down the front of the easel on to my paints. Time to clean up ! The wind was blowing harder and I was wishing I had a extra sweater to put on ! Even the tourists weren’t hanging out in this chilly damp blast, we had the place almost to ourselves. The surf was really beautiful as it washed over huge shelves of rock along the edge of the Nubble. The wind tore my hat off my head as I stowed my paint box and easel. I know why I live in Maine close to the Atlantic Ocean. There is nothing else like it. Mystery, mood, atmosphere, drama, huge forces of nature, and that constantly changing scene on the edge of the continent. Parsons Beach treated us to some great frothy surf and big wind! On the other side of the dunes the colors of the grasses and old drift wood were lucious. Jane stopped right in the road and started to sketch. The tide was rolling in filling all the marshes around us. The wind picked up and the temperature really started to drop. Jane’s water colors froze …BUT… the artist is the master of invention.. Jane put her paper and paint on the hood of her warm car and viola nice workable paints and a nice dryer to boot! With four hours of daylight left we went to a favorite spot on Pine Point. Nice, with summer over ….everyone is gone except the occasional painter and a few fishermen. The harbormaster’s office looked very quiet. The rain and the fog rolled in making for even a nicer mood. 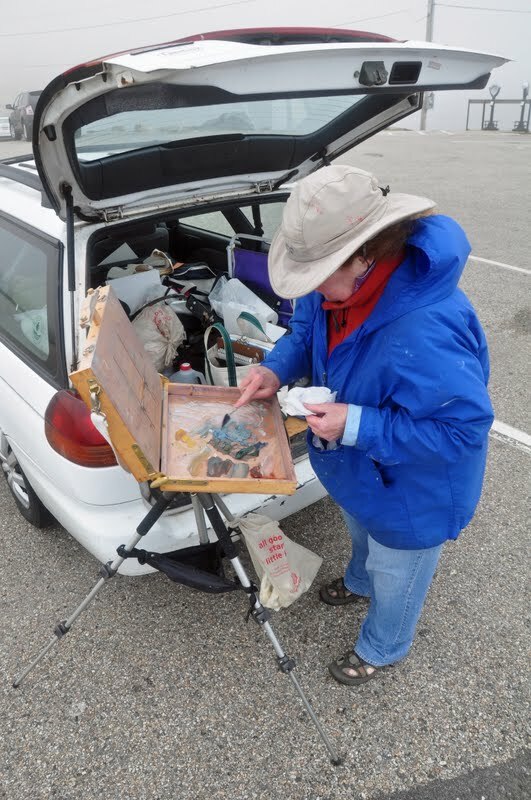 I was painting with my easel inside my car with the tailgate open. Jane found a nice over hang on the deck of the Rising Tide that kept her out of the rain. The tide was now going out, fog was rolling over the marshes and the boats which were floating in the water when we arrived now rested on firm sand. …a cluster of boats moored off the dock. I love my neighborhood ! I can always count on the seacoast to offer color, mood and fast changing weather. Paintings from this trip to be posted soon on PAINT, EAT, SLEEP. My friend Jane Ramsey arrived a few days ago for her first visit to Maine. 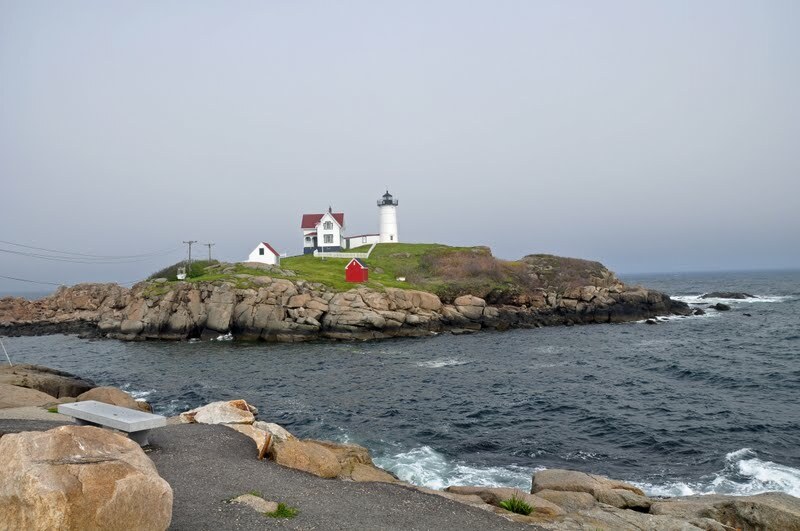 Where do you take someone who has never been to Maine? We had only 4 days. I tried my best. Everyday we painted at 2 different locations. Every night we returned to base camp at my house on the southern seacoast. We headed out early and painted till dark. We painted marshes, harbors, fish shacks, historic neighborhoods, rocky coastline and big weather. Mackerel Cove on Bailey’s Island is a favorite spot of mine. There’s this little tiny house on the edge of the cove that is a perfect summer getaway. Its right on the the beach. The full moon high tide left seaweed tracks up on the front lawn. The fishermen pull their boats out of the water and park them on the edge of the beach at this time of the year. The weather is getting too rough for the small boats. The wind was so strong this day the lobster boats hadn’t gone out. If you got behind a pile of traps you could paint, there was no wind! Strange… you could hear the wind whistle through them. The 2 sides of the house away from the water still had paint on the shingles. If you live on the water you have to paint the ocean side of the house often, the weather just wears it out. The wind got stronger. This was Marcus’ first time out painting in high wind conditions. He had to set up and sketch behind the open the car door the wind was so strong. The owner of these dories came by and told me how he used them to fish for herring in the coves. These boats are huge. The look like the dories in Winslow Homer’s paintings ! A company in Rockland Maine makes them out of fiberglass. Jane and I were set up behind our cars. The wind was blowing at least 30 – 40 mph. We were fine if we stayed in our 4 ft wind free area. The temperature started to drop after lunch. Jane was working in watercolors, I was painting with oils. Her paints began to freeze. She took out hand warmers and placed them under her palette to thaw them out… it worked. The wind started changing direction. I was laying in color, the light was changing fast and I was not about to stop. I had to grab my easel when a gust hit it. Marcus went out on the beach to sketch a good view of the dories. The front came plowing through, we finished our paintings and headed over to lands end for sunset sketches. So much to paint and so little time! I have been teaching plein air classes in my neighborhood since May. This session is once a week from 6- 9 pm. We have great late light and awesome weather! Kittery, Maine is a beautiful small town on the southern most point of the state. If you live in Kittery you have a number of great places to go swimming if you can stand the cold water. The town dock is packed with dories and skiffs and the harbor is stuffed with boats, both working and pleasure. Everybody set up in their favorite location on various levels of the docks and set to work sketching and painting. Lisa looked for a shady spot under the docks as she had already been painting out in the sun for hours before class started. The activity at the docks was bustling as people came in from their boats and others had just arrived and set up to fish off the docks. The air was cool and refreshing. The Stripers are running. Here’s Marcus on a lower level dock sketching away. He’s an absolute beginner and so proud of what he is doing that he shows it to everyone who will look. The complete opposite of most beginners! Here he is trying out some water colors – I had to really encourage him to try them as he has never used any watercolor in his life and is just starting to get used to sketching en plein air with ink and markers. More of the dozens of dories & skiffs. On the other side of this wharf are about a dozen pontoon motorized skiffs. Late light on the lobster boats and sail boats in the harbor. To the east behind the boats is Fort Foster that guarded the mouth of the Piscataqua River and the port of Portsmouth, when this whole area was part of the state of Massachusetts. 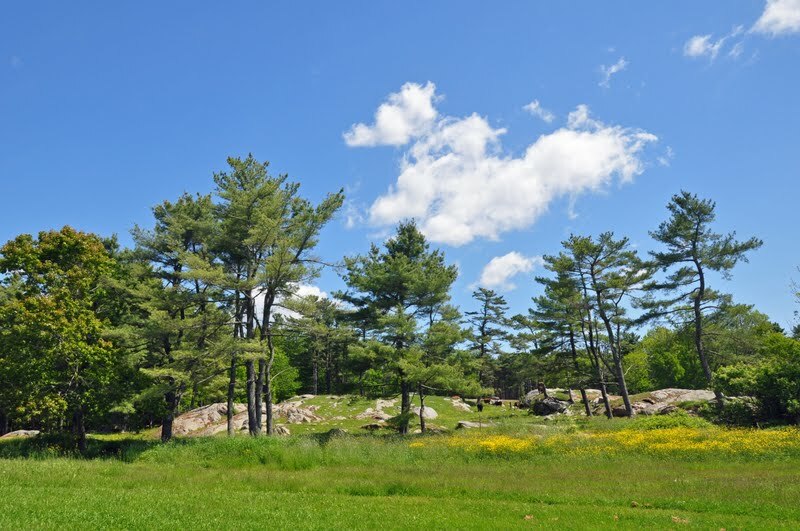 There are very old forts all along the coast of Maine and New Hampshire. Nancy was set up nicely up high on upper level of the dock painting the dories below her and the view to the east. The last pleasure boats were coming in and packing up their sails as the sun dropped low. We painted till it got dark and the salt mosquitoes came out. They were the worst! Need to find a super repellant for them the regular stuff didn’t work. Marian, Willek and Dennis headed up to Maine to paint for the day with me. We were hoping for big surf as our subject matter. This is the view from Israel’s Head looking south on toward Perkins Cove. Marian set up facing north looking toward the rocks with Ogunquit Beach in the background. Willek & Dennis of course went out farther into the big craggy stuff and set up on the edge. Willek is down on the rocks on the side of a crevice which in rougher weather would be dicey. Dennis was on the side of the path tucked into the hill side. A least he could step back and not worry about falling off. A couple of big guys who were walking by were so impressed with Willek’s start that they wanted his biz card so they could see the painting when he was finished. Here Marian is working away . It was calm and peaceful so she even had her umbrella up! I decided to paint this view of the rocks. Here is my start. See Marian holding her hat? Well, a big wind came in and blew her umbrella inside out and then it was gusty for the rest of the time. A front was coming in. This is where I decide to stop on this painting. I went and found Wilek packing up . And Dennis cleaning his palette. 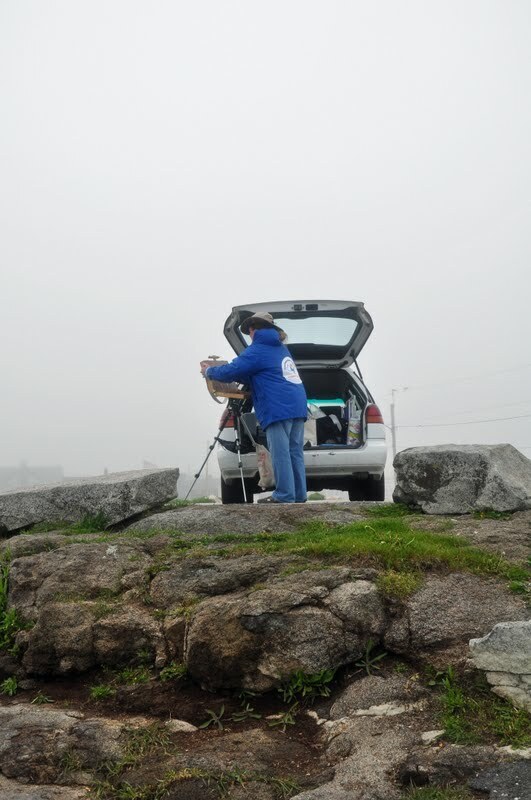 We then headed off to pick up some lunch and set up in our afternoon location, Perkins Cove. I spent the afternoon painting in Mackerel Cove on Baileys Island. This is a busy working harbor, all year round it is packed with boats going in and out all day. 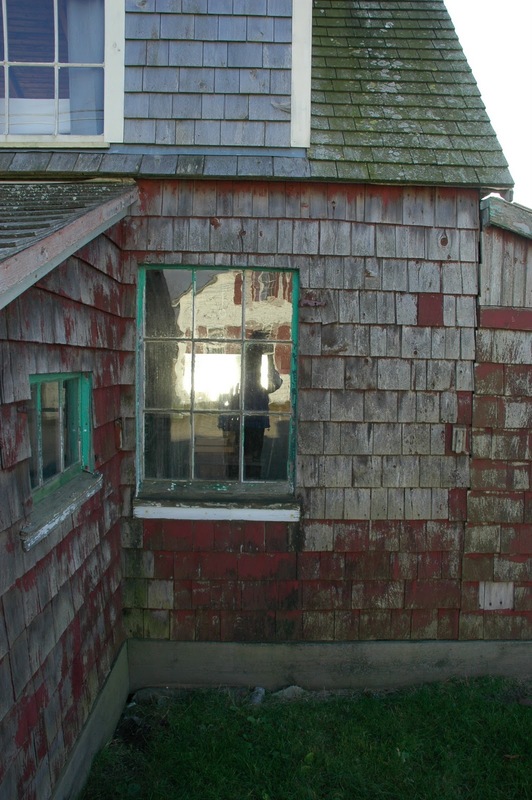 I set up on Abner Point Road and had a good view of the wharf and lobster coop. It was sunny and warm when I started to block in the wharf and small cove. Soon the wind picked up, the temperature dropped, I could see my breath and I pulled on a wool sweater(& my wool mitts). I had to stand behind my car and paint to stay out of the wind. At the top of the cove there was a tiny beach and park that local families came to walk and sail kites. Boats were pulled up on the beach. This small shack sat on the edge of the cove. I fell in love with it. It was so old and hadn’t been touched in years. Here’s a quick sketch I did of it in my book. Marker & watercolor 60 lb. paper. For my last painting of the day I decided to paint a boat that was moored at the wharf. Here’s the beginning of the sketch. The boat was driven off while I was painting it. Typical and not the first time my subject was taken away while I was painting it in plein air! This is the view of Mackerel Cove at sunset from Harpswell Island Road as I was getting ready to head back home. Sometimes when storms are coming there is a relative calm and the wind dies down. Its fairly unusual to not have wind either off shore or on shore along the coast. Its warmer and easier to paint with out the wind. This day was one of these rare quiet days . I grabbed my paints and headed out in the late afternoon to see what I could find. 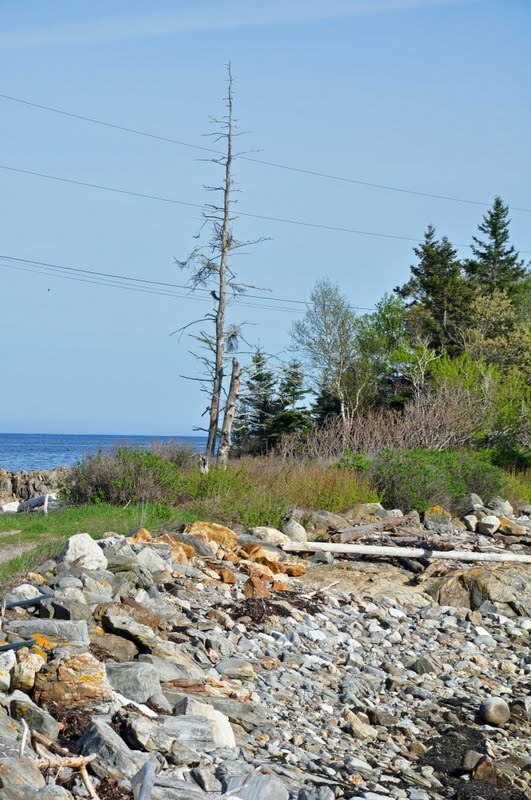 The first place I stopped was at the mouth of a small river in Cape Neddick where it opens into a bay . You can see how cold it is, the salt water has ice on it. But there were too many big snow banks to find a place to park. I decided to go to York Harbor which is often very windy . It was peaceful and calm – so rare. As you can see I was minutes after new snow. Fresh snow was on everything forming nice patterns and forms. A row of empty docks looked like a little train. Way out over the ocean was a band of yellow light where the sky was clear, the heavy bank of clouds hadn’t reached it yet. I did a quick sketch of that warm light and the river bank before it got too dark. By the time I took this picture the clouds had moved in. It was starting to snow. Have to grab these moments when you have them.